It is always a treat when folks outside the day-to-day "community" talk about Bigfoot. Especially when they are celebrities. these types of conversations always allow insight into the embedded avid Sasquatch conversation. this is especially special due to the contrasting views of of the Patterson/Gimlin film. In case you don't know the Patterson/Gimlin film (also referred to as simply the Patterson film) is a famous short motion picture of an unidentified subject the film makers purported to be a "Bigfoot", that was supposedly filmed on October 20, 1967, by Roger Patterson (February 14, 1926 – January 15, 1972) and Robert Gimlin (October 18, 1931). 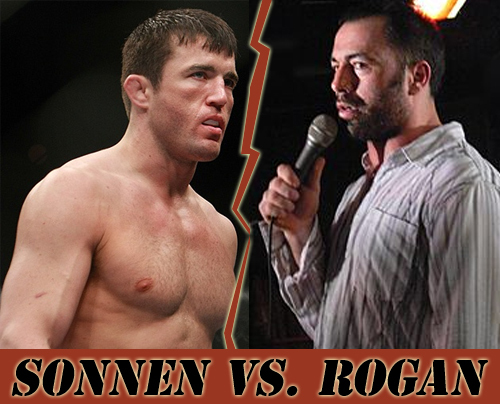 In the most recent edition of the Joe Rogan Experience Podcast, Joe Rogan calls [baloney] on Patterson Gimlin after UFC Middleweight contender, Chael Sonnen brings it up as evidence. In the end, they both agree that Sasquatch is a likely possibility and Joe credits Jane Goodall for his reason in belief. Also in the episode, Joe brings up Bigfoot call recordings and Les Stroud. Thank you to the www.thebigfootreport.com for sharing this video. Send him some of your thoughts! Thanks for the add Ro! I love how Joe has actually done his research. His argument against the film is thoughtful. His opinion on the P/G film may be swayed if he met Bob Gimlin. Rational, or not, we find Gimlin's testimony very compelling. Jeff Meldrum's stamp of approval helps too. Yeah, he's into it and plans on having Bobo on in July. It seems Joe is basing some of his reasoning on Bob Heironimus too, who is totally uncredible. Either way, it's amazing that he brings up Bigfoot with many of his guests. Joe has stated many time that he does not like walking off the beaten path. His dog was killed by a mountain lion at his Colorado mountain home. It is however great that a mainstream guy helps the cause whether or not he decides to take his interest further. Go Joe!!!! JOE IS THE MAN!!! I might not agree with everything he says, but I agree with his logic (his take on decriminalization of weed is the clearest I've ever heard). I also think bigfoot is probably the real deal, but PFG is a useless anomaly. It's either real or the greatest hoax ever. But since we can't %100 verify it why base your entire belief on PFG alone? Guy Edwards, Gimlin's testimony may be compelling to those of you who weren't around back in the day, but he's lying through his teeth and he knows it. Gimlin claims to be aChristian man but he continues to lie about the film. We don't hold much respect for Meldrum either after he was told by his associate on the NAAP project that the skookum cast was hoaxed by Noll and Randles; then Meldrum went ahead and rode the publicity train anyway knowing it was an elk wallow and not a bigfoot wallow. He even put it in his book. The deception in this research is monumental and touches many of your heroes.